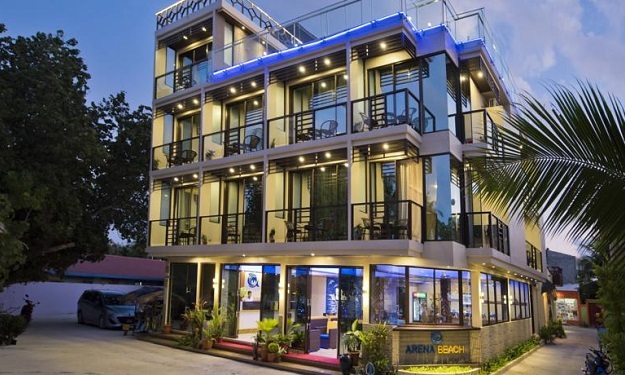 Arena Beach Hotel is a four star beach front hotel offering 19 Deluxe Rooms with the stunning views of either turquoise lagoon stretching to the azure blue ocean or the green garden of coconut trees which are scattered all over the island. Designed with a contemporary elegance, each of the rooms has a stylish feel combined with a touch of luxury in class and in appearance. The interior furnishing of carefully selected and evenly arranged rattan and teak furniture on timber flooring brings a warm and tropical ambience in all of the 170SQFT rooms. Arena Beach Hotel could accomodate a maximum of 50 guests at a time. The most beautiful room at Arena Beach Hotel located at the top floor of the building featuring as a penthouse providing accommodation for 4 adults. The interior of the room designates a luxurious environment with spacious beds, a couch and an elegant bathroom featuring glass walls with stunning view of the nature. 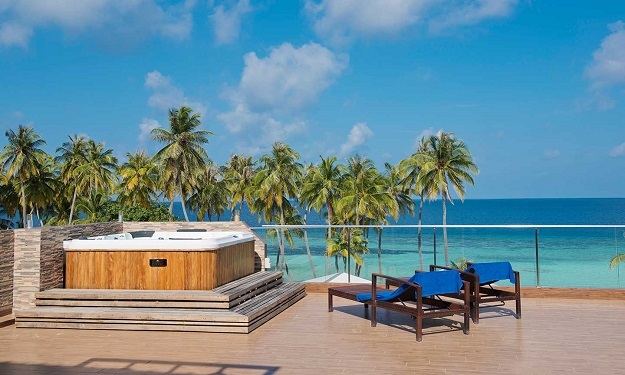 The Grand Deluxe Room distinctively features glass fitted walls on all sides while offering a private terrace with sun lounges and seating arrangements to enjoy the magical views of the amazing blue ocean and the tropical palm trees surrounding the island. Overlooking the magnificent ocean, the 9 Deluxe sea view rooms with Balcony at Arena Beach Hotel offer guests with the option to experience a resort-like stay with all the modern luxuries. 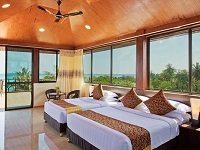 Whether you are lying on bed or sitting on a chair at balcony with a cup of coffee, you will be mesmerized by the stunning views of nearby resorts, turquoise lagoon and the scenaries of dolphins that jumping above the ocean at times. All of our rooms feature open full height balconies that can be slided to enjoy the fresh breeze of air swifting from the ocean. One of the most beautiful rooms at Arena beach hotel, the super deluxe rooms provide abundant spaces with an open balcony to enjoy paranomic resort-like views. Located distinctively at the roof top floor, these rooms provide guests with maximum privacy and an easy access to the open terrace where guests can enjoy at Jacuzzi and sunbeds while having refreshing beverages at Terrace. Discover the amazing underwater world of the Maldives on a dive trip from Maafushi Island. 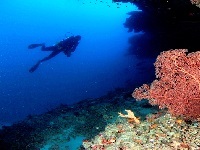 There are plenty of incredible dive sites we can introduce you to around Maafushi Island. 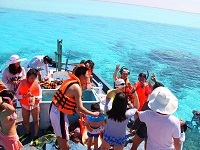 Kuda Giri Wreck, Guraidhoo Corner, Cocoa Corner are some of the very popular sites. Mantas, Sharks, Hammerhead Sharks, Turtles, and numerous wild and lovely creatures in the ocean together with its great-untouched coral reefs make the diving around the island an unforgettable experience. Check out the available dive packages at Maldives Passions Dive Center and Maafushi Dive, the two main dive centers in Maafushi. Maafushi Island is surrounded by many resort islands and trips are organized daily. Different resorts charge different services and cover charges for entry. 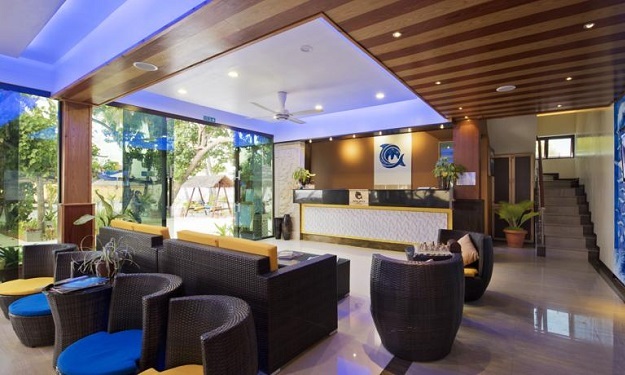 The commonly arranged trips are to Fihalhohi Island REsort, Fun Island, Rihiveli Beach, Holiday Inn Kandooma, Anantara Resorts and Biyadhoo Island. Your holiday canot be complete without visiting the sandbank Furafathi which is right in front of the Maafushi Island and you can exprience complete peace and privacy. You may request lunch or snacks for a complete half day picninc at the sandbank. The night fishing excursions at Maafushi are aimed at making your Maldives holiday a perfect one. There is nothing more beautiful than celebrating the special moments in life. At Arena Beach take pleasure in creating lasting memories. 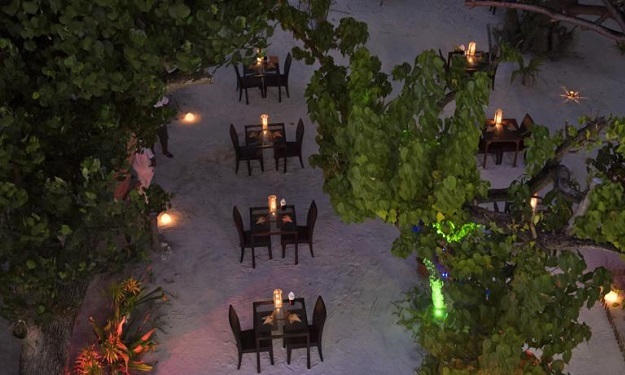 Celebrate your wedding or any other special occasions with us, here in the Maldives! 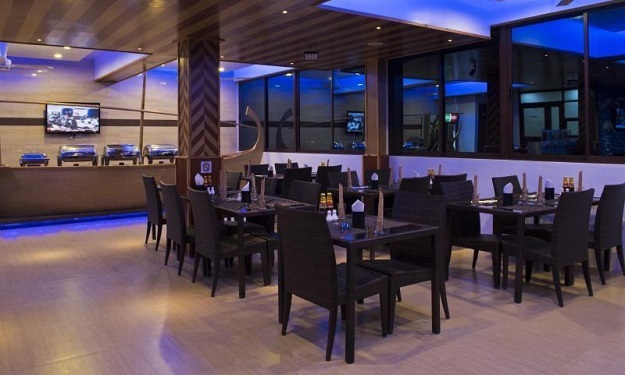 The Arena Hotels offer guests a wide range of delicious dinning experiences from the choices of western, eastern, Asian and local tastes. 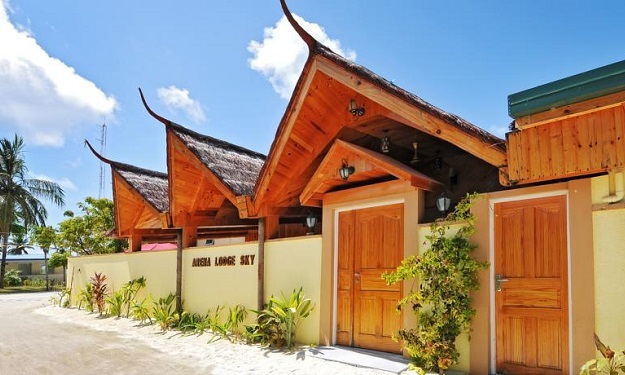 You are greeted with "bon appetite" at restaurants at Arena Beach Hotel with different styles of dining pleasures blended with the natural charm of Maldivian hospitality.